Authors note: This book has taken 4 years to write and progress from text to book form - This book has everything I have learnt in 40 years of designing and building sail and powerboats ! 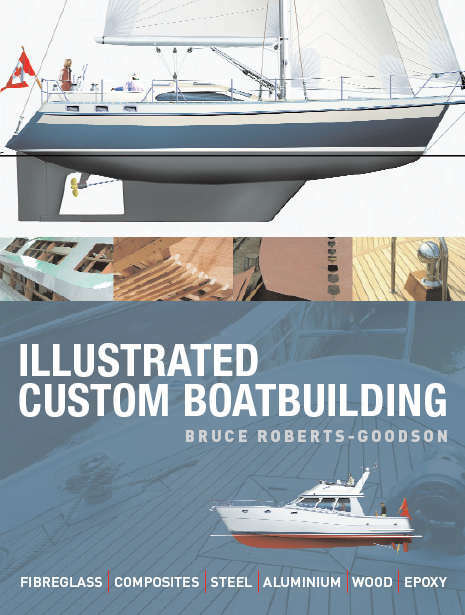 INTRODUCTION - This book is written for those who are still undecided as to which boatbuilding method and material they would use to build their next boat. The word ‘build’ is meant to cover a boat you totally or partially build yourself or have totally or partially professionally built by others. CHAPTER 1 BUDGETS AND PLANNING - Details of all the things you should consider when you are planning building your own boat - right from choosing the design, costing out the project, costs of building and costs of future cruising etc. CHAPTER 2 CHOOSING A BUILDING SITE - Details that you will need to consider when finding and choosing a place to build your boat; everything from power requirements, storing building materials and tools etc, moving the boat to launching site etc. CHAPTER 3 BUILDING IN FIBREGLASS – MATERIALS AND TOOLS - Details of all the materials and tools you will be using to build a boat covers, fiberglass, wood, steel and aluminum. CHAPTER 4 BUILDING IN FIBREGLASS – BUILDING THE HULL - Details of the step by step process of building both sail and powerboat hulls in fiberglass, all with step by step photographs and drawings. CHAPTER 5 BUILDING IN FIBREGLASS – DECKS, TANKS AND APPENDAGES Details of the step by step process of building both sail and powerboat decks and superstructures in fiberglass all with Step by step photos. CHAPTER 6 BUILDING IN TIMBER Details of the step by step process of building both sail and powerboat hulls in timber. Wood epoxy, strip plank and plywood techniques explained in detail. Construction techniques, all with step by step photographs and drawings from start to completion of the entire boat. CHAPTER 7 BUILDING IN STEEL OR ALUMINIUM Details of the step by step process of building both sail and powerboat hulls in steel and aluminum using latest metal boatbuilding techniques which are explained in detail - all with step by step photographs and drawings from start to completion and launching. CHAPTER 8 DESIGNING AND BUILDING INTERIORS - Details of the step by step process of building both sail and powerboat interiors. 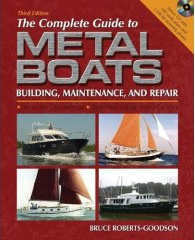 Choosing the layout and step by step photos and drawings of building and fitting out the interior of your boat. CHAPTER 9 ENGINES IN SAIL AND POWERBOATS - Choosing the correct engine and fuel systems for your sail or powerboat. Installation details and hints. CHAPTER 10 ELECTRICAL SYSTEMS IN SAIL AND POWERBOATS - Choosing the correct electrical system for your sail or powerboat. Installation details and hints. 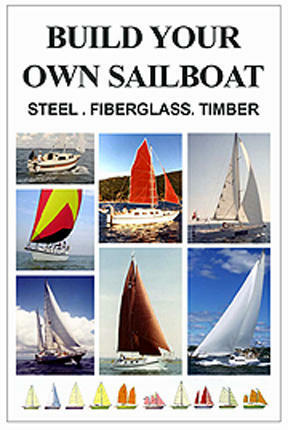 CHAPTER 11 CHOOSING A SAILBOAT DESIGN - Choosing the correct sailboat; covers a wide range of sailboats from 19 ft to 75 ft - 5.75 m - 23 m including choice of all materials and building methods. 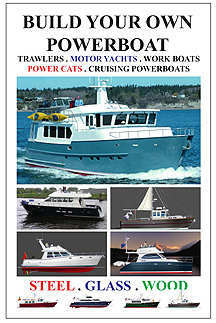 CHAPTER 12 CHOOSING A POWERBOAT DESIGN - Choosing the correct Power boat - covers a wide range of power boats from 19ft to 85 ft 5.75 m - 26 m and includes a choice of all materials and building methods. APPENDIX A FURTHER READING - Details of other books that we recommend as being helpful when you are actually building your boat. APPENDIX B GLOSSARY - Details of boatbuilding words and what they mean also general nautical terms you need to know. Hi Bruce, I have received your Illustrated Custom Boatbuilding. We recommend that you read this hardcover book - Order now and we will pay the postage. POSTAGE PAID ON HARDBACK BOOK.